Q: What’s your food/diet philosophy? -I don’t like “diets” and I can’t stand when people say “Oh my gosh, I have GOT to go on a diet”. It drives me crazy. -No foods are considered “off limits” because then I will inevitably crave them somethin’ wicked. I could decide to make mushrooms off limits, and I would end up wanting them at every meal. -Moderation & portion control are so important. If I want cheesecake, I’ll have it. If I want some sweet potato fries, I’ll eat them. If I want ice cream, you KNOW I’m going to have some. But I’m not going to eat these things every day, and I’m not going to jumbo size my order. Have the food, enjoy it, savor it, and move on from it. -Incorporate LOTS of fruits & veggies!! I try to hit my daily veggie intake between my lunch & dinner meals (unless a Green Monster or omelet is in order, then they’ll make an appearance at breakfast). The fiber in these keeps me full and satisfied all day…although I’m actually trying to cut back a little bit on the green veggies because I think they might be causing me some extra stomach pains? -Lean, healthy protein is a MUST! Some of my favorites are chicken, fish, eggs, and cottage cheese. Q: What’s your fitness philosophy? A: First and foremost, whatever your fitness routine is, it has to be FUN! You have to enjoy what you’re doing, otherwise, you know you’re not going to stick to it. For example, I’ve tried my darndest to get hubby to go running with me, but he justdoes not like it. Finally, I told myself, “Duh” – if he doesn’t enjoy it, quit bugging him about it! For me, fitness is a combination of cardio + weight training + stretching. I have come to enjoy various types of cardio such as running, spinning, BodyAttack classes, kickboxing classes, and sports. Sports are a GREAT way to incorporate exercise – you’re focused on having fun with friends, not “how many calories you’ve burned”. For weight training, BodyPump has become my new best friend. I never really enjoyed lifting – I found it boring, and since I wasn’t “working up a sweat”, it didn’t feel like I was doing much. But with BodyPump, the class keeps me motivated, my heart pumpin’, and my muscles burnin’! Stretching is something that I wish I incorporated more, but really do enjoy doing. I really like doing Pilates, and I have a couple DVD’s that I will often switch up. Pilates is really great at strengthening the core, which is so important. My current goal is to find a type of yoga that I really like and will stick with. I’ve tried some off ofyogadownload.com, which is a great site, but I just don’t know if the ones I tried were for me. I’m on the hunt for some good yoga! I don’t have a set exercise schedule, because my daily schedule changes every single week (dinners out with friends, late nights, extra work, softball games, etc.). My goal is to get 6 days of exercise in each week, making at least 4 of them cardio, and 2 of them weight training. Sometimes I hit my goal, sometimes I don’t. But in the end, it all works out! 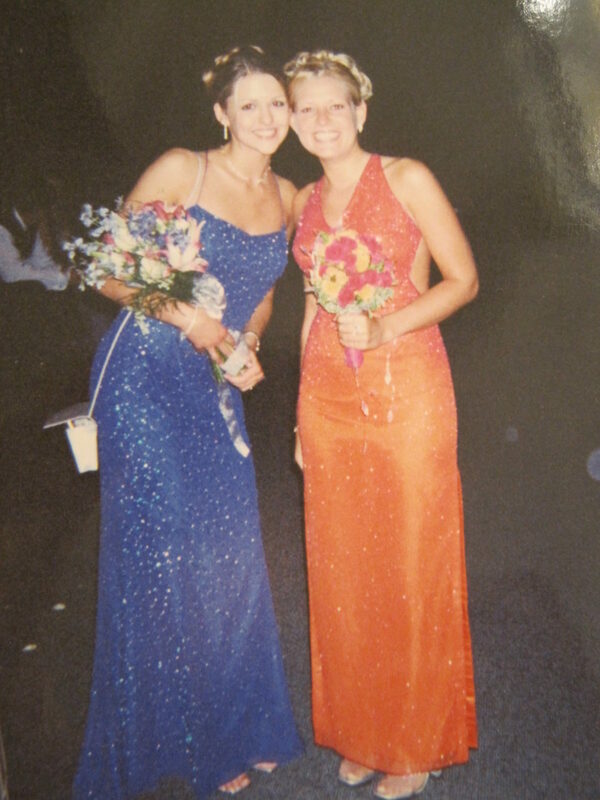 Q: What did your high school prom dress look like? A: Well, rather than explain it, how ’bout I show you! 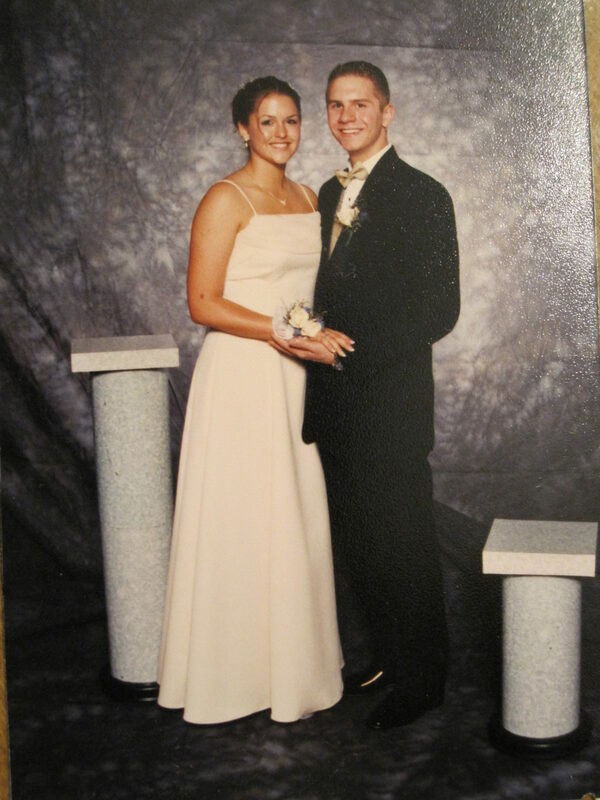 Since Jay and I went to different high schools, that meant more proms – 4 to be exact! I was able to find photos of 3 of my dresses. Jay’s Junior Prom – EEEK…this photo scares me! Haha, I was a little heavier back then…cosmic brownies & zebra cakes were pretty much a food group at that point. 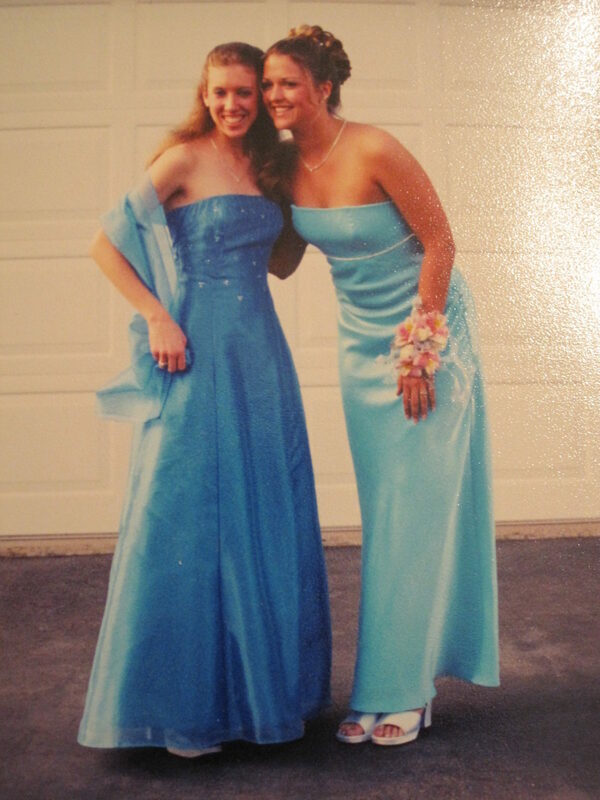 My Senior Prom – I absolutely LOVED this dress! I would wear it again if I had a reason! Q: Did you and Jay have a song in high school? Is it different from “your song” now? A: Yes, actually we did! “Our song” in high school was “Where You Are” by Jessica Simpson & Nick Lachey. Our song now would have to be the song we danced to at our wedding, which is “Love Song” by 311. Q: What sports did you play in high school? A: I played volleyball from grades 9-12, softball in grades 9 & 10, and I was also on the varsity bowling team from 8th grade – 12th grade. Yup, bowling! And in my junior year, our team was actually the New York State Champions! Q: Have you ever taken Zumba at the gym? A: I actually have not, only because my gym wasn’t offering it. HOWEVER, I just saw a sign yesterday that said they were going to be starting a class up next week! Soo, I’m totally trying it out…I’ve heard such great things about it! Q: How did you and Jay (aka, “your hunk-o-man” – thanks, Julie!) meet? A: Jay and I actually met “unofficially” a few times before “officially” meeting. Back when I was a sophomore in high school, Jay was dating one of my good friends at the time, so I knew “of him”. He went to a different high school, so I didn’t see him all the time, but whenever there were school dances or a party, he was usually there. I actually have a picture from a high school dance where he is standing about 3 people away from me, and we had never really even spoken at that point! I also knew Jay because we both bowled in the same Saturday morning bowling league. I would always “watch him from a-far”, and definitely had a crush on him! However, I was a little too shy to go up and talk to him, so we would really just smile and say “Hi” if we crossed paths. One of the firs things I ever said to Jay was at a party, when he had just been “dumped” by the girl he was dating. I knew it was a sticky situation, and I felt really bad. So when I saw him standing by himself against a wall (the poor thing!) I decided to go up and just ask, “Are you ok?”. The only response I got was a look up, and a “yeah, I’m fine”. And that was it…BUT, the seal had been broken. Fast forward about a month, on the night of Thanksgiving, when another mutual friend of ours got us talking on AIM (do you guys remember that?!?). We talked for HOURS that night, and were pretty much inseparable from that point on. It was on December 5, 1999 that we became “official” – I was 15, he was 16. And although we did have some rough patches and did take about a year apart right after I finished college, we still never lost touch. We had a lot of growing up to do, and unfortunately, it wasn’t working when we were together. BUT, we grew up, we worked things out, realized that we were totally right for each other, and have been going strong ever since. A:I’ve also read a lot of the controversy on soy milk, and I’ve also read a lot of the benefits. While I certainly wouldn’t consider myself well-versed on the pros & cons of soy milk, I’ve decided that for now, I’m going to stick with it. The amount that I consume during any given week is pretty small (maybe 3-4 cups total?) so at this point I’m not concerned. There are a few side effects that I’ve read about, however, that I have experienced, so I am thinking about cutting it out for a week or two to see if I notice any difference. Q: What is one of your favorite “guilty pleasure” foods? A: If I’m going sweet, it’s most definitely a BIG ice cream flurry with caramel, oreos, & cookie dough. If I’m going salty, then it’s gotta be sweet potato fries. They’re my favorite! A: Hopefully soon! Jay and I had such a GREAT time when we visited back in April, but it was a little chilly so we didn’t get to do everything we hoped. We’re thinking maybe sometime over the summer…if we do, I’ll let you know, Kara! Q: What’s your favorite TV show (besides Cougar Town)? A: One Tree Hill!!! I’m obsessed with this show…I couldn’t BELIEVE the ending last week for the season finale! I cried like a baby. Q: What meal would you choose to eat for every dinner for the rest of you life? Breakfast? Lunch?